National developer AvalonBay Communities is no stranger to Greater Boston with three towers in Back Bay, the newly opened AVA Theater in the Theatre District, in addition to Cambridge, Somerville, and elsewhere throughout the state. But Avalon North Station is its largest undertaking yet at 38 stories, 415 feet, and 503 units. Among the long list of standard luxury amenities such as garage parking, fitness center, and 24hr concierge, residents will also get to enjoy a 2,000 square foot roof terrace and lounge on the 35th floor with sweeping views of the Harbor, Charles River, Cambridge, and Downtown. Avalon North Station is also directly next to TD Garden, which is currently undergoing a massive expansion to create over 1.8 million square feet of office, retail, hotel, and parking space. Leasing began Fall 2016 and occupancy will probably stabilize toward the end of 2017. Like many other new constructions, new residents are eligible for free rent promotions and do not pay the broker fee. At 160 units and less than ten stories, The Girard is one of the smaller developments to hit the map recently, compared to Millennium Tower, or Avalon North Station. From the same developers as Midway Studios and the ArtBlock condos, The Girard is built to a higher standard than some of the newer rental buildings—for example, real oak flooring vs. vinyl faux-hardwood, kitchens with Silestone countertops and Kohler fixtures, GE and Bosch appliances, and Nest smart thermostats. The Girard began leasing this past Fall and limited promotions (including no broker fee) are currently being offered to new residents. Rates start around $2850 for the 1beds, up to $7000+ for the 3beds. Construction on The Benjamin is set to wrap up in the first quarter of 2017, with pre-leasing beginning shortly thereafter, and move-ins beginning early Summer. Like its neighbor, Watermark Seaport, The Benjamin is a two-building mixed use development with 250,000 square feet of retail space, which will include a movie theater, bowling alley, and Equinox gym. Not much is known about the units themselves but as you can see from the rendering, we can expect plenty of private balconies, which up until now could only be enjoyed in select, rare-to-market units in 315 on A, 100 Pier 4, and 22 Liberty. There aren’t any details yet about pricing but it will likely be in the same market range as its neighbors,100 Pier 4 and Watermark Seaport, with upper level harbor-facing three bedrooms approaching $10,000. In line with most of its competitors, The Benjamin will most likely incentivize new residents with free rent, low upfront costs, and paid broker fees. 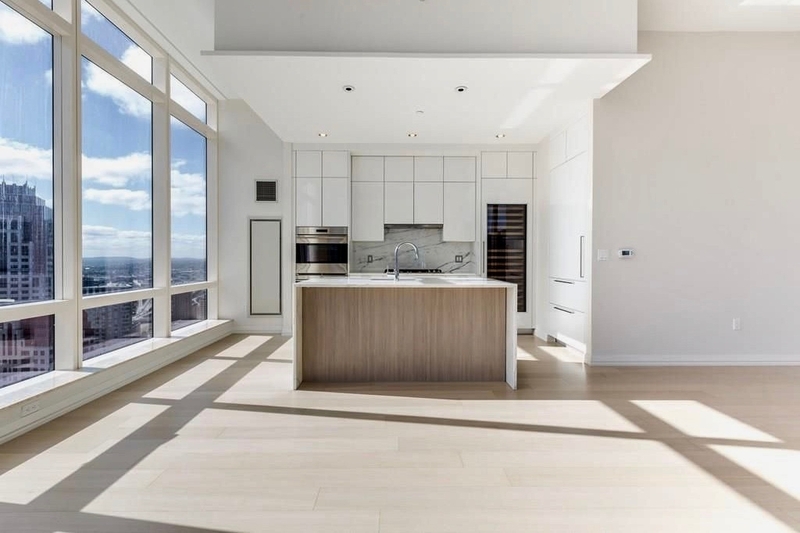 Designed by the same firm behind the Hancock Tower and it’s soon-to-be neighbor, the Four Seasons One Dalton, 30 Dalton is the most expensive rental building is Back Bay, and ranks among the one of the highest-priced openings of 2016, next to Watermark Seaport, Millennium Tower, and One Canal. Opening this past October, 30 Dalton will have to face the challenge of lease-up directly next to the city’s largest residential development of the next 1-2 years, with the adjacent lower level units (2beds) starting around $7,000 per month. Despite this, one of the towers 3,000+ square-foot super-penthouses, conservatively priced at $26,000/month, has already been rented. In all likelihood, the more insulated Western half of the building—which has great views of the Charles River and Fenway Park above the 10th floor—will lease up on schedule, with additional concessions offered for those willing and able to to sleep through the pile drivers. Although for this price, if you’re flexible with location and open to paying a broker fee, I would recommend a condo building such as The Clarendon or Millennium Tower instead. Pierce Boston is the brainchild of developer Samuels & Associates, the firm behind other prominent Fenway luxury buildings such as the Van Ness, 1330 Boylston, and Fenway Triangle Trilogy. Not only is Pierce one of the only luxury condo buildings in Fenway, but at 30 stories, it will be also be the tallest residential building West of Back Bay—nearly twice as tall as the Viridian. It’s close proximity to Fenway Park will give some of its residents direct field views and if that isn’t enough, there are deeded penthouse cabanas for sale as well, starting around $300k for 150-250 square feet. Pre-sales have already begun and construction should be finished by the latter half of 2017. 2016 has been the year of Millennium Tower but considering that this is the first blog post and it’s technically still 2016, I have touch on a few things. With the first move-ins beginning in August at the end of the season, there is still much to choose from, whether you’re looking to rent on buy. I expect this will disappear in a few month once we’re back in the high season and more new residents—especially renters—come over from the surrounding towers, such as 45 Province, AVA Theater, and The Kensington. Sales currently range from $1.2MM for a City Residence one bedroom to $12.5MM for a Penthouse Level three bedroom, and rentals currently range from $3,800 for lower level 1bed to an aspirational $17k for a Grand Residence 39th floor three bedroom corner unit. For additional information on pricing, rental promotions, and availability for any of these properties, please contact me directly at msteinert@warrenre.com or 617-903-8194.